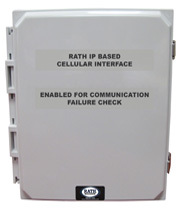 The RATH® Wireless Elevator Solutions work with any of our 2100 Series SmartPhones and Cellular wireless technology options. This will allow you to access Emergency Services utilizing a standard, fully code compliant phone with a simple, hassle free installation. You can either order as a complete system or retrofit an existing RATH® SmartPhone, in the field, with a wireless system.